If you’ve ever had trouble using an editable resource on TeachersPayTeachers, this post is for you! 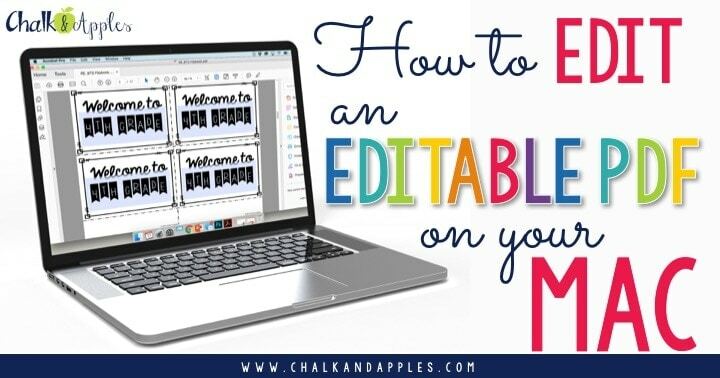 Editing an editable PDF file is very simple once you know what to do. I have a video tutorial to walk you right through it! 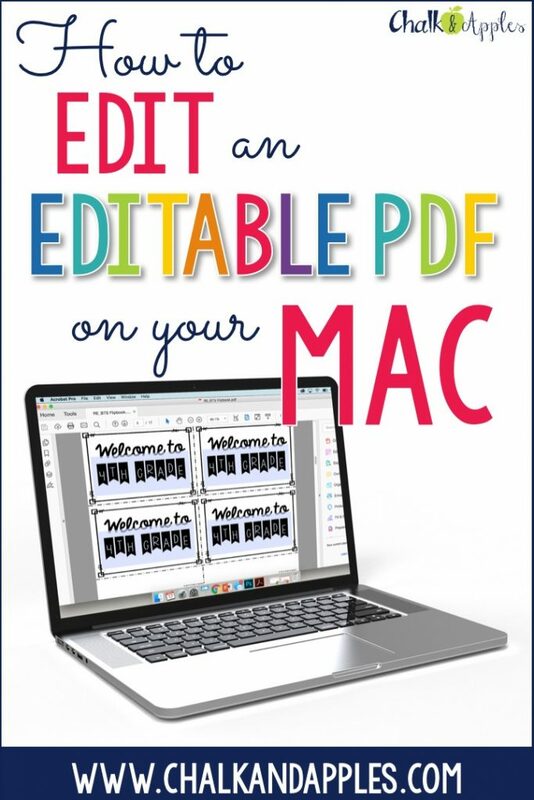 I get asked questions all the time about how to edit the editable PDF files that I have in my TeachersPayTeachers store. I wrote a tutorial a couple of years ago on how to edit a PDF file on your PC, but I wanted to share a tutorial specifically for Mac users now that I’ve made the switch to a MacBook. If you’re more of a written directions person, you can find them after this video. 1. Open the file in Adobe Acrobat Reader. (Do not try to edit in Chrome, Internet Explorer, Preview, Foxit, etc. You will only get frustrated!) If you don’t have Adobe, you can download it here. You may need to find the file in your Downloads folder, cmd+click, and select Open with… Adobe Acrobat Reader. 2. Click in one of the editable text fields. (They are usually highlighted in purple.) Change text as needed. The second copy on each page will automatically update for you when you click out of the text field, so that you don’t have to edit twice. 3. If you need to edit the font, font size, or alignment, you may do this with the Properties Bar. Cmd+click in a blank area of the toolbar and select Show Properties Bar. When the box appears, you will see all of the text properties. 4. If you see “No Current Selection” in the Properties Bar, one of two things has happened. It could be that the creator of the PDF didn’t enable rich text editing for those text fields. If you believe the advanced editing should be available to you, try re-downloading the resource from TPT (for some reason, that seems to work pretty often) or email the resource creator and let him/her know that you’re having trouble. FYI – all of my editable flipbooks are et to allow you to use the properties bar, but some of my teacher toolboxes and teacher binders do not. Do I need to purchase Adobe Acrobat Pro to edit? Absolutely not! In Adobe Reader, if you click the Edit PDF button on the right side, you will be prompted to purchase Adobe Acrobat Pro. Rest assured, you do not need to do this in order to edit a PDF you’ve purchased from TPT. Can I save my work to use again next year or to reprint for new students? Yes! All of my editable PDFs are set up to allow saving. If you’re having trouble saving, be sure you are opening the file in the most recent version of Adobe Reader, and not an old version or a different PDF viewer. Can I delete, move, or change the clip art on the PDF? The edges of the page are being cut off when I print. How do I fix that? Easy. In your print settings, choose either Fit or Shrink to Fit, depending on your system. Thank you for this Kristen!